This event draws on Mary Mattingly's exhibition What Happens After to raise important questions about the relationship among environmental extraction, militarization, and the politics of decolonization. The discussion will center on exposing how environmental extraction is tied to a longstanding history of colonial violence enacted against Indigenous peoples across the globe and highlight the importance of thinking through environmental justice within the context of Indigenous political organizing, resistance, and movements for self-determination. 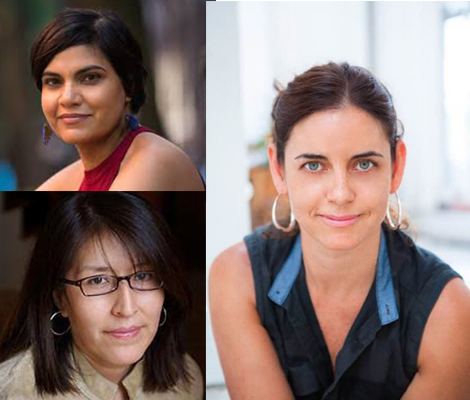 Panelists include Jaskiran Dhillon, Macarena Gómez-Barris, and Sandy Grande. Jaskiran Dhillon is a first generation anti-colonial scholar and organizer who grew up on Treaty Six Cree Territory in Saskatchewan, Canada. Committed to the tenets of public intellectualism, Dhillon’s scholarship is intimately connected to, and informed by, on-the-ground advocacy and direct action. Her work spans the fields of settler colonialism, anthropology of the state, anti-racist and Indigenous feminism, youth studies, colonial violence, and Indigenous studies and has been published in The Guardian, Cultural Anthropology, Truthout, Public Seminar, Feminist Formations, Social Texts, and Decolonization among others . Her first book, Prairie Rising: Indigenous Youth, Decolonization, and the Politics of Intervention (2017), provides a critical, ethnographic account of state interventions in the lives of urban indigenous youth. Her new research focuses on developing an anti-colonial critique of the environmental justice movement by examining Indigenous political movements working against the extractive industry, including the resistance at Standing Rock. Dhillon is an associate professor of global studies and anthropology at The New School and a member of the New York City Stands with Standing Rock Collective. Macarena Gómez-Barris is chairperson of the Department of Social Science and Cultural Studies and the Global South Center at Pratt Institute. She is author of Beyond the Pink Tide: Art and Political Undercurrents in the Américas (2018) and The Extractive Zone: Social Ecologies and Decolonial Perspectives (2017), which theorizes social life through five extractive scenes of ruinous capitalism upon Indigenous territories. She is also author of Where Memory Dwells: Culture and State Violence in Chile (2009), and co-editor, with Herman Gray, of Towards a Sociology of a Trace (2010). Sandy Grande is a Professor of Education and the Director of the Center for the Critical Study of Race and Ethnicity (CCSRE) at Connecticut College. She is also currently serving as a Visiting Professor and Scholar at Columbia University (2018-2019). Her research and teaching interfaces Native American and Indigenous Studies, Education and critical theory, toward the development of more nuanced analyses of the colonial present. Her book, Red Pedagogy: Native American Social and Political Thought (2015) was published in a 10th anniversary edition; she has also published numerous articles and book chapters. The act of collaboratively changing the form of an object with a violent and complex history, can be a powerful one. Can it become ritual? Healing? Through the transformation of a massive military vehicle used in the Gulf and Afghan wars, nine performance artists created instead a bridge for communication and a stage for re-visioning a future for public spaces in an increasingly militarized world. Participants of the redesign included: Rosie Bruno, Nicole Cheng, Emily Bluck Chow, Angela-Renee Coakley, Fred Fleisher, Yunchi Huang, Maria Hupfield, Sto Len, Paul Middendorf, David Hamilton Thomson, Shelley Senter, and Renae Reynolds.